This book deals primarily with the collecting of Chinese ceramics – and probably 90%+ of the book consists of short biographies of collectors in the UK and US. The mind behind the book is Dominic Jellinek, a former Director of Bluett & Sons in London, who acquired the Bluett archives when the business closed some years ago. All biographies are of deceased collectors/dealers for the most part, and the book is stronger on the more well known ones. For less prominent (more private) collectors, the biographies might be thin, and they will likely have made it to the book as their collections were sold by either one of the large auction houses or dealers in London and New York. The introduction presents the only ‘readable material’ – while the remainder is more for reference. However, this section is quite interesting as it deals with the ceramics contact between Europe/America and China over the centuries. As such, one gets a good idea of the type of pieces that made the journey to Europe/America over time. There is also a short section on fakes, which is perhaps not ground-breaking, but still worth the read. Lastly, there is a small selection of collector/dealer labels. However, to avoid feeding more information to the fakers, these are all quite small, grainy, and in black and white. However, they give a broad indication as to what a label from say Bluett would have looked like, including several versions over the time period of the company. So is this book worth it? It’s a steep price, but it will surely only get more expensive. 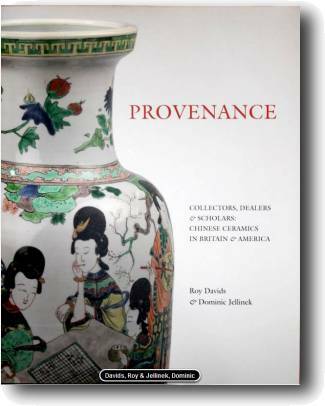 It is an excellent reference book for those who prefer to collect pieces with provenance, especially those that occasionally appear at dealers in London, of which I recall having seen several of the names listed in the book over the years. When accompanied by catalogues from the dealers and auction houses that have sold off many of these collections, the book becomes more valuable, as the plates in the book do not add too much value. For some of the lesser known collectors, the book would be of greater value, as information would not necessarily be readily available. What the book will not do is to help a buyer assess the actual piece, and the plates included in the book are more illustrations of particular pieces from collections and interior shots from dealer rooms. They add flavor – not substance. As to the information on the various collectors, dealers etc. I don’t think there are any disputes as to the book’s quality – in fact the British Museum donor bios will frequently reference this work. This book should perhaps sit next to Stacey Pierson’s “Collectors, Collections and Museums – The Field of Chinese Ceramics in Britain, 1560-1960” in your book shelf – as they would likely complement each other.